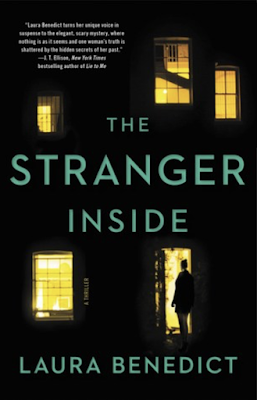 What would you do if you came home to find a stranger living inside your house? 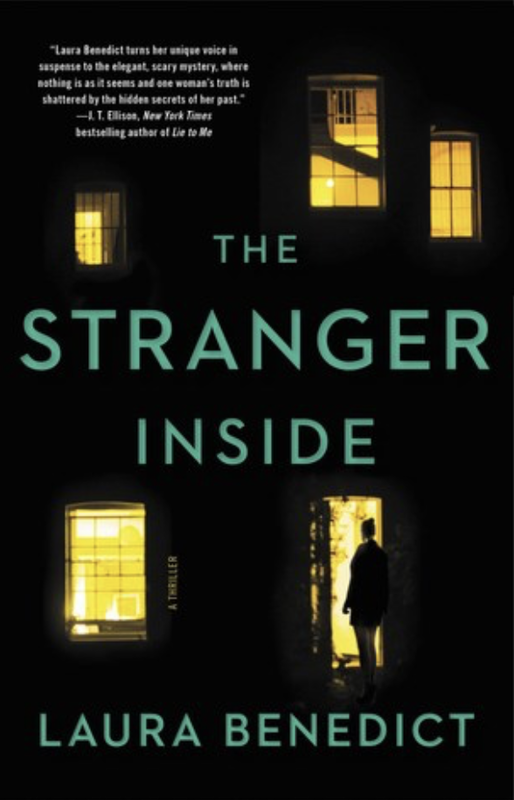 That's the question that Laura Benedict, an Edgar- and Thriller Award-nominated author, asks in her psychological drama The Stranger Inside. You've just come back from a long weekend, and all you want to do is collapse on the sofa. There's a bike on the porch that isn't yours. There's a stranger living in Kimber Hannon’s house, and he knows something about her. Benedict writes of Kimber meeting the police at the house, "Officer Maby is perhaps thirty, definitely seven or eight years younger than Kimber, the age of someone she might have babysat when she was a teenager. Her short-sleeved uniform shirt, buttoned securely at the neck, is snug around her apple torso, and her pants have military creases. Not a single strand of chestnut hair is loosed from her low bun, and her large eyes and sensuous, full lips are devoid of makeup. Her voice is smooth and controlled and confident, and Kimber silently realizes that Officer Maby has both a voice and face for radio. "Kimber turns around to stare. Her neighbor, Jenny Tuttle, stands in strobing red and blue cruiser lights, her red wig and her candy-apple-red glasses both slightly askew. The jacket of her velour tracksuit sags on her wilted body, and the slightest of breezes carries the odor of cigarette smoke from her clothes to Kimber. The little dog sits at her feet. Now, they both look defiant. "Kimber finds her voice. 'What are you talking about?' She has a love-hate relationship with the woman she's lived next door to for the last year. Jenny is the neighborhood busybody and knows all th gossip, though she rarely leaves her house except to walk the dog. But she is also kind, occasionally gifting Kimber with half a casserole or tomatoes from her garden. Her dog is a sweet, lively thing. Now Kimber is wondering if Jenny has finally lost her mind. She only admits to being sixty-eight years old yet looks eighty, or older. "A breathy sound from the officer draws Kimber's attention. 'I don't know what she's talking about. I didn't rent my house to anybody. Why would I do that?' Where the officer's mild face was serious and business-like a moment earlier, now there's a glint of skepticism in her eyes. She looks from Jenny to Kimber. 'That's crazy. Why would I do that?' Kimber repeats. Now she really does feel as if, like Alice, she's on the other side of the looking glass."